FlightGear Flight Simulator or simply Flightgear is an amazing flight simulator you can use if you want to know how to fly an aircraft. Even though it’s tagged as a game, it’s actually a program that doesn’t contain any gameplay strategies. 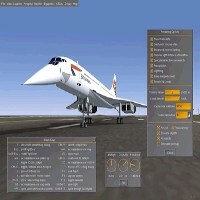 It’s purely a flight simulator that will help you become familiar with flying almost any type of aircraft. The software runs on almost all types of platforms including Linux, Mac, BSDUNIX, Sun-OS and of course, Windows. It’s the perfect software to relax to if you’re tired of rolling in the ground and running for your life while playing various video games. FlightGear contains plenty of options when it comes to aircraft choice and more are still being developed. If you are tired of driving around cars or playing with battle tanks, then Flightgear might be a great option for you. It’s a flight simulation program that allows you to experience what it’s like to fly your own aircraft. The game provides 3D graphics and a lot of choices when it comes to the kind of aircraft you want to fly. Cessna planes are available and even the Concord. Attention to detail is pretty good and the scenery once you are on flight, it is not bad either. There are nice 3D clouds and if you get too close to a city down below, you could see some smoke from the chimney or even trees. Users will have the chance to choose their preferred flying time as well, like if they prefer to fly at night, morning or at dusk. Moreover, the weather option is also available. It allows you to experience what flying in a drizzle or a thunderstorm might be like. Another special feature is the sloping runway. For a newbie pilot, it’s often challenging and interesting to be able to fly off into a runway that you cannot see up ahead. Despite all the bells and whistle’s, there are a few things to take into consideration before downloading the program. For instance, the software does come in a sizable chunk at 148 MB. This does not include the model airplanes, flying saucers and jets you would want to download later on. The maps of certain places you would want to fly in would also need to be downloaded before you can start. Since it’s purely a flight simulator and not a game, you would need to apply some real world theory to them, which means, it would help if you read the tutorial or manual. Overall, the game is pretty decent and is actually fun and addictive. Once you master the “easy aircrafts,” you can move on to more challenging things. With new models being developed until now, FlightGear will definitely keep you busy.